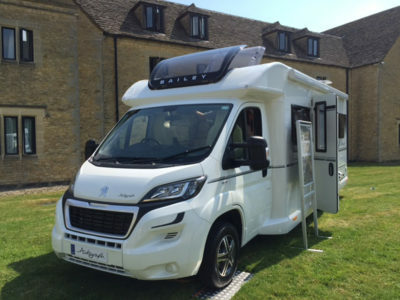 The Bailey Autograph 75-4 motorhome, newly re-designed for 2017, has a fixed double bed, an offside washroom, centre kitchen and a four-berth layout. With an AL-KO AMC chassis and ultra-low profile design and a new and large “Aero style” double glazed sky view over cab roof light and cab air-con, first appearances are impressive. The ergonomically designed captain’s seats, with twin armrests have integrated fully adjustable head rests and have been carefully considered for long-distance travelling. Seats and backrests have high resilience and softer foams in the right places. Oh, and don’t overlook the twin cup holders – a vital attribute! In the habitation area, the mood is distinctively high end; a contemporary boutique, bijou look showcasing Bailey’s trademark Mendip Ash cabinetry with brushed and stainless steel fittings in the kitchen, washroom and living area. Overhead lockers feature a high gloss finish with matt handles and have adjustable height shelves. Storage is plentiful with low level and high level lockers. The light and airy living area is striking and suggests the maximum comfort, space and storage whilst not compromising on practicality and, certainly for two people, a more than element of luxury. A large Heki roof light over the lounge is largely responsible for the openness by day and at night the ambience is added to by new additional ambient over-locker lighting and new additional low level task lighting; cue the soft music from the door and lounge speakers in the factory-fitted optional Media Pack or Media Pack Plus. DreamSleep technology is a new feature, and already award-winning, with multi-layer, domestic style seat base cushions, complemented by shaped back rests in the lounge. 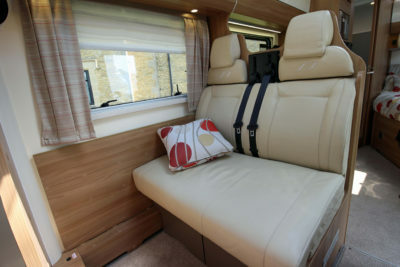 It has improved airflow capabilities and should the lounge area be used as a sleeping area, then the advanced technology makes for easier bed make up and with enhanced comfort. Pleated window blinds are practical for day time or night time and mock curtains add a bit of sumptuousness. The free-standing dining table is stored in the wardrobe. The kitchen has a new basalt stone finish worktop – allegedly self-healing! Four heavy duty self-closing “push-to-lock” drawers are complemented by a large overhead locker. A combi-oven/grill, four-burner hob, microwave oven and the 130L fridge with a piano-black finish are standard equipment. The modern swan neck tap is eye-catching. 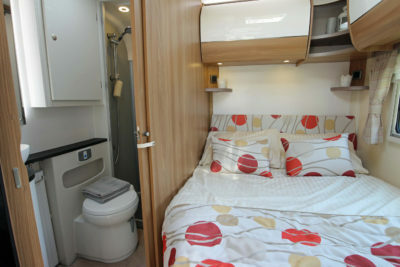 The washroom has been revitalised and now has a one-piece, fully sealed shower cubicle, a retractable clothes line (very handy), an oval washbasin surface mounted on to a cupboard, a concealed header tank, a panel radiator, a back-lit mirror, two LED lights and a water saving shower head. The fixed double bed is of course a gas-strut assisted, lift-up style, and the underbed storage area has a flush fit double seal exterior access door. Exterior features are no less impressive with a new “Aero Style” Fiamma F45S wind-out awning, a new gas BBQ point and Truma 100W roof mounted solar panel, new graphics and lighting. The model we saw had several optional extras fitted to it including leather upholstery, Media Pack Plus and alloy wheels. 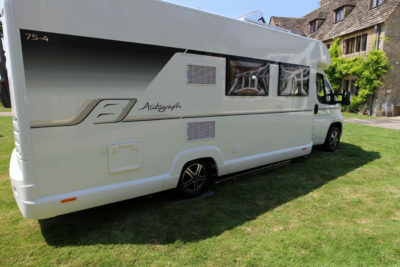 Verdict: A high-end specification motorhome without the high-end price tag. Minus: Add too many optional extras and personalise your vehicle and watch your payload lose kgs quicker than you can say diet lemonade. 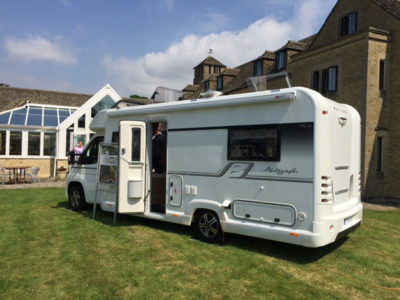 In-a-nutshell: A very desirable vehicle within the Bailey of Bristol motorhome portfolio. 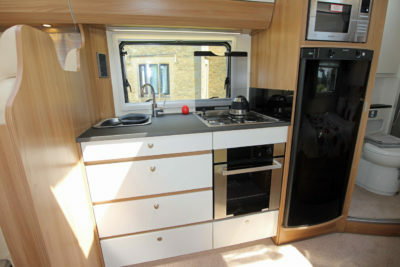 There’s more information on the Autograph range on the Bailey of Bristol website www.baileyofbristol.co.uk. 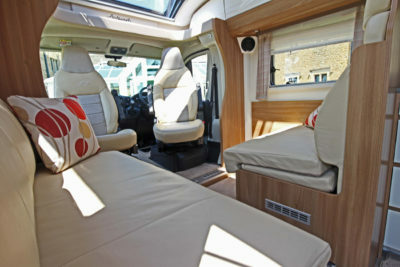 To find out more about insuring this or your current motorhome see our motorhome insurance discounts page. Base vehicle Peugeot Euro 6 Bianco white cab 1997cc 160bhp 6-speed manual gearbox. The Bailey Approach Motorhomes are a Nightmare. I have a AA750 and now find I cant get on many ferries due to the poor ground clearance, In 4 months the Battery Box has been smashed in bits 3 times, even pushed it up through the floor resulting in expensive repairs. The clearance on the Bailey Aproach rage is not as specified onlt 160mm clearance when empty. That long rear overhang with poor ground clearance could give expensive problems on ferry ramps, uneven ground and tight continental pitches. Not worth mentioning I suppose when it comes equipped with two “vital attribute” cup holders and a “water saving” showerhead. Still you are an insurance company so no doubt you will be happy to fork out. Another “showroom friendly” behemoth, limited in use by poor design and real-world impracticality. We’re sure in most situations this motorhome will be very useable, and with care, that overhang shouldn’t cause a problem.